Here's what I almost made for last IMBB (check out that amazing round-up! ), but I was interrupted and had to continue at a later time. Warning - these are super, super rich! I could eat one and that was that. What on earth am I going to do with the five left in my fridge? Note to self - make these mini-sized next time! They taste wonderful though. I have almost no experience with frosting - it's not at all a part of Swedish culture, so I first encountered it when I was an exchange student in the US. And.. well, I don't like it all that much in general - but this one, mm. This is good stuff. The yield is terrible on this recipe - sorry about that. It was supposed to give eight large or 12 normal-sized cupcakes. I halved it, and got 11. That prompted me to make the full recipe of frosting, thinking that the frosting otherwise wouldn't be enough.. um, mistake. It made a lot, a LOT, of frosting. So, be forewarned, and have another muffin tin ready. Preheat the oven to 170 degrees C. Mix butter and sugar until fluffy. Add the eggs. Add the milk and coffee, and blend well. 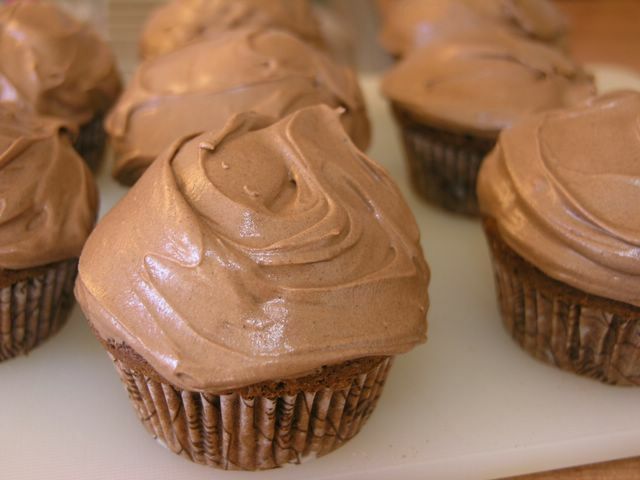 Mix the dry ingredients - flour, cocoa powder and baking powder - and add the wet ingredients to the dry. Stir in the chocolate pieces. Divide into lined muffin tins, and bake for 20-25 minutes. Beat the butter and the cream cheese ith an electric mixer. Add the sugar and cocoa powder, and mix into an even cream. Add the coffee, a spoon at a time, until you have a nice spreadable frosting. Frost the cooled muffins. Anne, these cupcakes look delicious! I think I would love the coffee taste in these. The frosting job really looks good too. The cupcakes look fabulous! Just as I was also searching around for a good coffee-flavoured cupcake recipe, yours came along! Just how intense is the coffee taste? wow...... i am so hungry. the frosting looks fantastic as well.. that is what gets me. i need cupcakes in my house again!! Galinusa - good point, it is a real big recipe. I should have questioned it :) To get a more intense coffee flavor, I think you could probably substitute the milk with more coffee! (Or coffee infused milk - like instant coffee made with milk) As it is, they're a little bit weak.